...it’s practically in our DNA. Of course, not all modifications go according to plan and you end up with photos of ruined projects like so many Pinterest-inspired crafts that didn’t quite nail it. 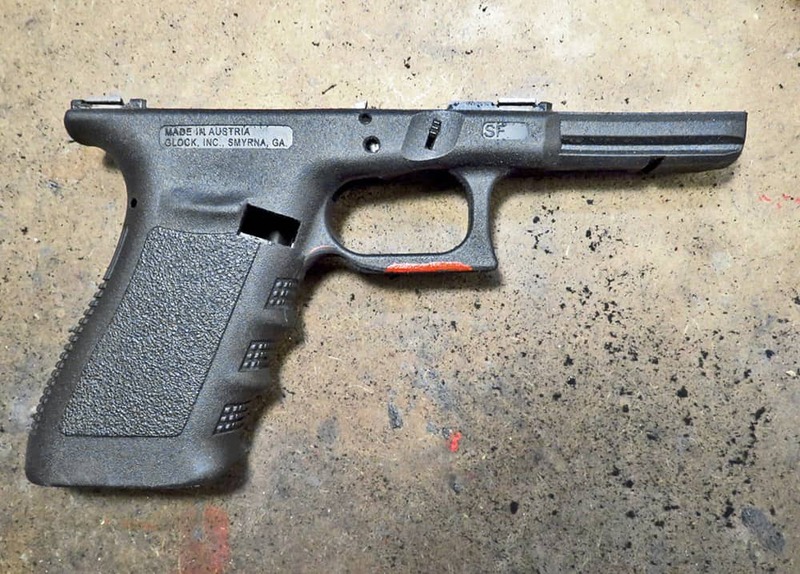 In the firearms world, GLOCKs are said to be the small block Chevy of pistols given the ease with which they can be modified to run better, faster and harder. 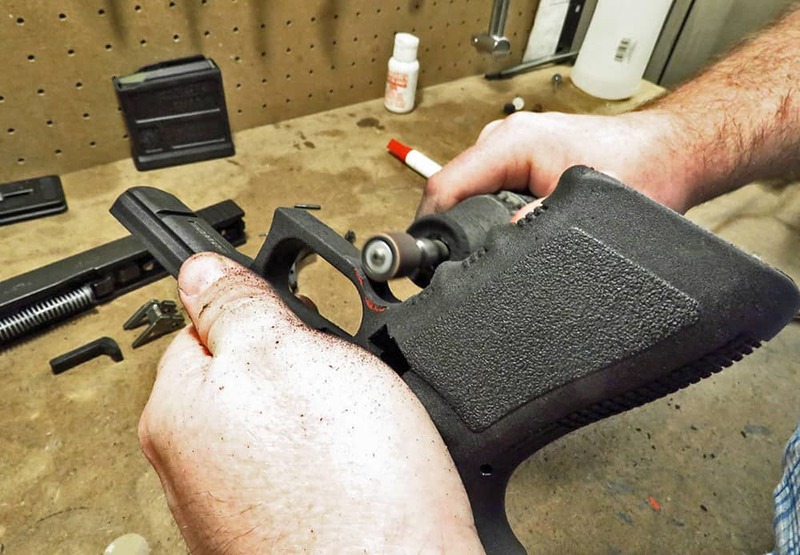 Next to stippling, removing the finger bumps and undercutting the triggerguard are two of the more common modifications done to GLOCK pistols. 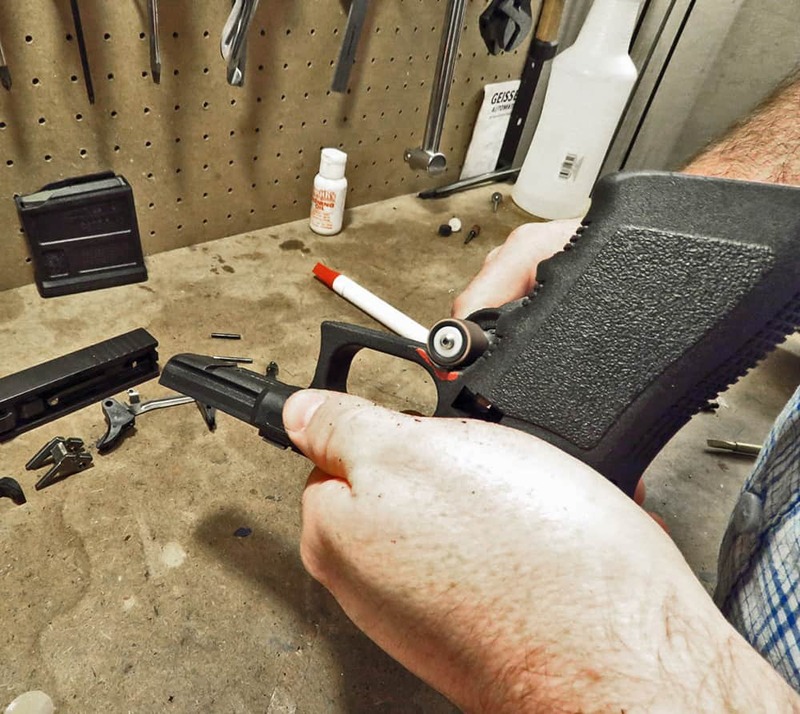 Sometimes a GLOCK pistol will meet its demise in the process but luckily I’m going to take you through my process to do these modifications so you don’t become an internet meme version of a cautionary tale. 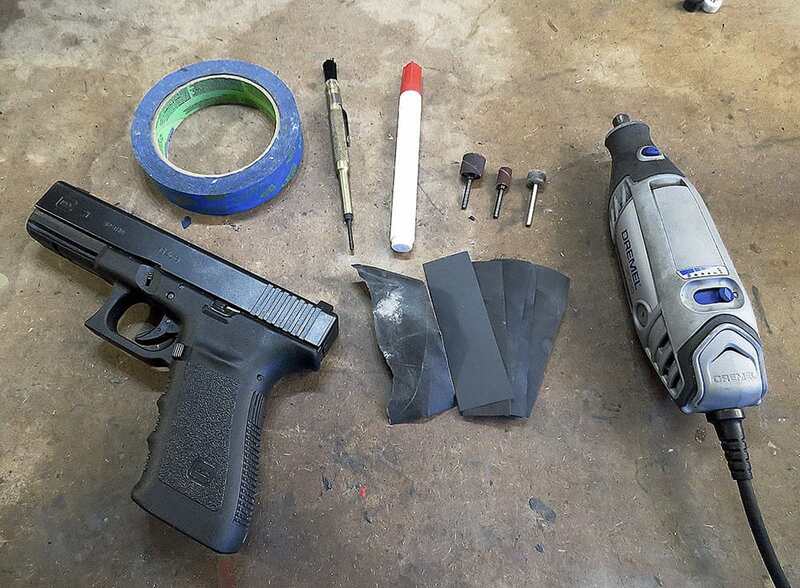 You only need some basic tools and a little patience to take your GLOCK pistol to the next level. Understand I’m not doing these modifications solely because they look cool; mainly I do them for ergonomic reasons. As good as GLOCKs are, “GLOCK knuckle” is a common affliction for some owners where the middle finger rubs along the triggerguard and causes a painful blister. Undercutting the triggerguard can help alleviate this. Additionally, many shooters find the finger bumps don’t really fit their hand so they remove them to create a straight front strap for more comfort. The ability to grip the pistol a little higher is only a fringe benefit since GLOCK pistols already have a low bore axis. At first the modifications can seem daunting but it’s not difficult if you have a game plan and simply take your time. 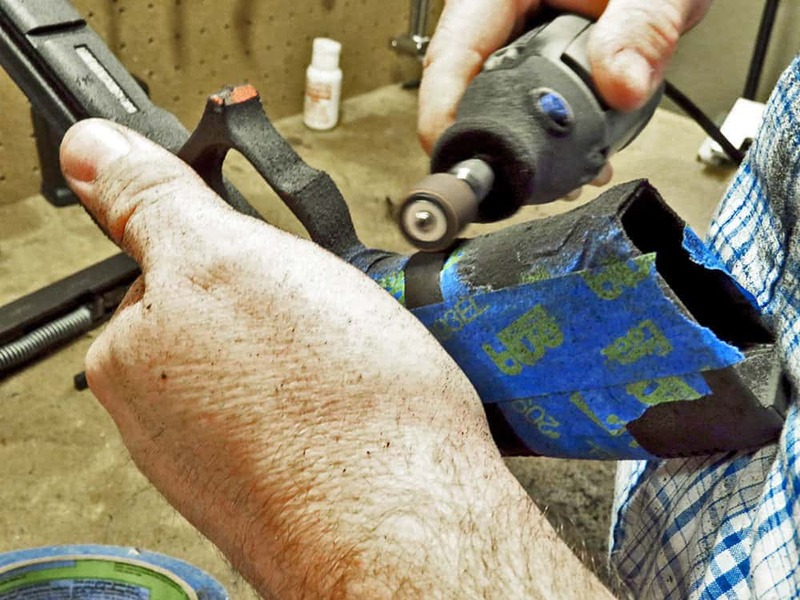 Attacking the frame with a Dremel tool is a surefire way to needing a new frame. Get a Sharpie or paint pen that will contrast well with the frame of the pistol so it’s easy to see. To start, disassemble the pistol and strip the frame down so the components won’t be damaged by the Dremel tool. Next mark where you want to remove material so it acts as a guide to help mitigate potential “oops” moments. When I’m doing the undercut I’m not just plunging downwards with a sanding drum to make a deep groove for my finger. I’m actually taking material away by going toward the muzzle to create more space for my knuckle. The amount of material taken away is up to you, but there still has to be some meat left on the triggerguard to give it structural support. Don’t just hold the sanding drum down until you make a deep notch. I only apply light pressure and move the drum side to side, checking the progress often. When starting to remove the material from the triggerguard and finger bumps I use the 1/2" sanding drum to take away a little bit at a time, keeping the RPMs right around the mid-range or just a little slower. If it’s too fast, you can start to melt the plastic and push it ahead of the drum and/or gouge the material. The finer 120 or 240 grit sanding drums work the best because they don’t remove material as quickly or leave deep scratches in the frame. It makes it easier to sand everything down to a smooth surface at the end. Notice how material wasn’t really taken away close to the pistol grip, but more toward the trigger. I use a rolling motion going forward and backward to remove the material. As I wear down my marks, I check often to make sure I don’t go too far. A forward undercut acts as a reference point for my support hand and provides a small ledge to help put a little more pressure into my palm. I’ve found the 1/4" sanding drum works well to get the radius at the front and back started. Once the depth and radius are set with the smaller drum, I switch back to the 1/2" drum to remove the material in the middle and bring everything to the same depth. I taped off the grip texturing to give them a little protection from the sanding drum and act as a guide to keep me on the straight and narrow. Save your fingers and use the marker or a dowel rod to smooth out the radius sections. After a couple hours’ of wet sanding those areas you were wrenching on should have a clean, smooth appearance. When the undercuts and finger bump removal are complete, the marks on the frame have to be sanded down using high grit sandpaper to give it a smooth, finished appearance. I recommend picking up a pack of assorted wet or dry sandpaper containing something like 800–2,500 grit sandpaper. Wet sanding will give you the best results so have some water handy and start with the lowest grit sandpaper and progress upward from there until the scratches are gone. Wrapping strips of sandpaper around the Sharpie or marker is a great way to smooth out the curved areas, and you can use your finger in circular motion for the flat spots. This is a very time consuming process but the end result should be a smooth, somewhat dull surface that matches closely with the rest of the frame. The felt polishing wheel for the Dremel can provide a nice sheen if you’re looking for a little something extra finish wise. This type of project may not be for everyone but it is certainly doable with a little planning and an afternoon of time to focus on the task at hand. The key is to go slowly and the end result should be a good-looking pistol customized to your needs. If you have a plan and take your time the end result will look almost as if it came from the factory.